Posted on January 2, 2017 January 1, 2017 by SherylPosted in FoodTagged panckaes, peanut butter. Gonna try these! They sound yummy! I would think so. It sounds yummy. If you make the recipe using almond butter, you’ll have to let us know how they turn out. I am planning to try this recipe with almond butter at some point. I’ll let you all know how it turns out! I haven’t tried this – but it sounds good. Buckwheat flour adds a nice hearty, nutty flavor to foods. Peanut butter pancakes were new to me, too – though I googled it and found several more modern peanut butter pancake recipes. Definitely going to make these! Thanks. Around here they slap the peanut butter on the pancake,so why not in the batter. Wonder if they would notice if I did ?! I love peanut butter on bread or crackers, but I don’t care for it in the form of cookies. Guess the only way I’ll know if I like these is if I prepare them. With one hungry grandson still here, this might be a good time to try this recipe. Your grandson would probably like these griddle cakes– but if you don’t like peanut butter cookies, this may not be the recipe for me. The Peanut Butter Griddle Cakes themselves aren’t very sweet, but when served with maple syrup, there is definitely something about them that makes me think of peanut butter cookies. What a great recipe. Wonderful find. Thanks. Wow, I would almost think that they would be heavy. Will have to try this recipe! They weren’t heavy, and instead were almost cake-like. My guess is that the 2 teaspoons of baking powder – and relatively small amount of peanut butter resulted in the griddle cakes rising nicely. Hi Sheryl. This is my first visit to your blog. I am excited to read more vintage recipes. So interesting. I think I’d like to make these pancakes. Welcome! 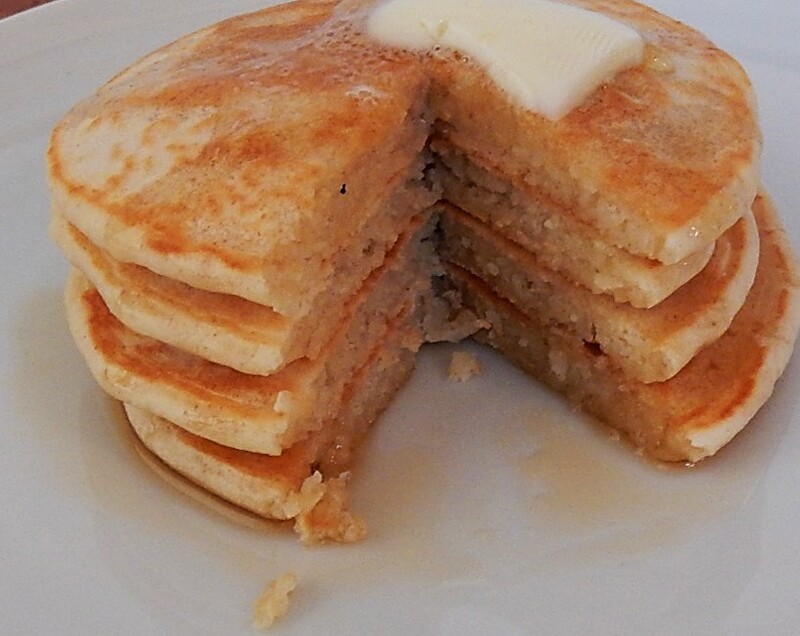 I think that you’d like these griddle cakes. Oh, my. This is a must-do. Can you imagine them with a few chocolate bits included? It would be Reese’s peanut butter cups for breakfast. That’s a little over the top even for me, but I think these would be great for a supper. mmm. . . They would be wonderful with some mini-chocolate chips. Can pancakes be a dessert? Wow, that photo makes me drool! I can just imagine that your husband asked for more in the future – lucky him for being your official taster. I’m very fortunate that my husband enjoys trying the various recipes I make. He has definite opinions about which recipes are his favorites (and which are his least favorite). Sounds like they were a hit. I’d never heard of the peanut butter griddle cakes. I love your recipe treasures that you’re sharing with us. Yummy! I have a lot of fun finding and making the old recipes. I am so fortunate to have you and other wonderful readers who enjoy reading about the foods I make. I used to make pancakes for my kids every morning before school. I bet they would have loved these griddle cakes!! Your kids were lucky to have a mother who cooked breakfast every morning. Mine generally ate cereal on weekdays. It is funny, I would never have thought of these coming from a hundred year old recipe. I would think of this as a more modern recipe…they sound good. When I made this recipe I wondered when peanut butter was first available. It obviously has been around for more than 100 years. sounds delicious! I will have to try these. I think that you’d enjoy them. Oh, yummy. They look so light and fluffy, not like I would picture at all, considering the peanut butter.. The recipe only called for 4 tablespoons of peanut butter — which is enough to give a nice peanut flavor, but apparently not enough to create a heavy texture. I made them & loved every bite,….delicious! It’s wonderful to hear that you enjoyed this recipe. Oooh they sound really amazing!!! My husband is a huge fan of peanut butter, so I’m sure he’ll love this! If he likes peanutbutter he’d enjoy these. You could top with bananas to turn these into Elvis Presley Pancakes 🙂 his favorite was grilled banana and peanut butter sandwiches. Oops, and don’t forget the butter, since not grilled persae.